Medicare Part D is the component of Medicare that deals with prescription drug coverage. Any individual enrolled in Medicare Part A or B has the option of also enrolling in Part D in order to have coverage of prescription drugs included in his or her Medicare plan. Part D can be obtained either as a “stand alone” component or as part of a Medicare Advantage plan. In the former case, the prescription drug coverage is separate from the medical coverage provided by Part A or B. In the latter, it’s included as part of a comprehensive coverage program. There are many plan options available through Part D; however, many people already receive prescription drug coverage through another means (such as employer-provided health insurance) and may not need to enroll in Part D.
What is the donut hole? 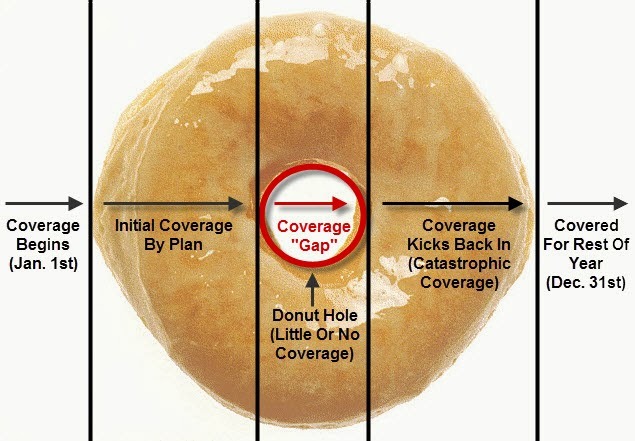 The donut hole is a gap in prescription drug coverage that kicks in at a certain point. Once an enrollee reaches that level, his or her coverage ceases until he or she reaches another level, at which point “catastrophic coverage” kicks in to help pay for medications. One of the goals of the Affordable Care Act is to gradually eliminate the donut hole. This is scheduled to happen in phases and if all goes according to plan, the donut hole will be closed by 2020. In the meantime, caregivers and the seniors for which they care need to be aware of its existence and what it means. In 2014, the donut hole starts when a person’s total drug costs total $2,850. That amount includes both what an individual pays in co-payments and deductibles and what their plan contributes in payments. This is calculated starting on January 1 of each year. Once that $2,850 total is exceeded, an individual in 2014 will pay 47.5% of the cost of brand-name drugs and 72% of the cost of generic drugs. This level of payment continues until the point that the amount an individual has paid in terms of co-payments, deductibles and costs of drugs plus 50% of the cost of brand-name drugs equals a certain amount – $4,550 in 2014. At this point, catastrophic coverage kicks in, with the plan then paying 95% of the remaining costs of drugs until the end of the calendar year – at which point the process starts all over. Is there anything that can help? Consider buying cheaper generic drugs or over-the-counter options. Doing this can help a person avoid reaching the $2,850 limit. However, it’s necessary to check with one’s doctor about the advisability of doing this. Some doctors prescribe brand names for specific reasons. _Keep using the Medicare discount card even when in the donut hole. _This will continue to ensure you receive the drugs at the discounted rate your plan provides. _Look for assistance. _Some pharmaceutical companies have patient assistance programs that help defray the costs of certain prescriptions. Some national or local charitable organizations may have programs that can help; check out www.benefitscheckup.org as a starting place. And some states have State Pharmaceutical Assistance Programs for which an individual may qualify. _Investigate Medicare’s Extra Help. _Medicare has a program that may be able to provide assistance to some low income Medicare recipients. Even experienced caregivers can find the donut hole, Part D and other aspects of Medicare difficult to sort through. This is an area where HomeHero can help; the experienced workers from HomeHero can look through the Medicare information with caregivers and help them interpret the meaning of the documents in order to make wise choices regarding coverage.